My rendition of Vincent Van Gogh. 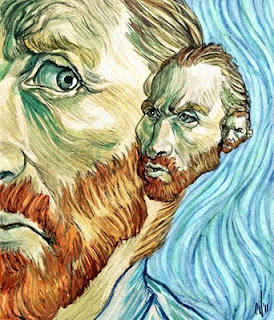 I noticed how earshaped his head was in his self portraits, so I thought it would be interesting to explore the concept of his madness and the possible reason behind him cutting off his own ear- the persistent nagging of the artist's self-doubt and the sinister whisperings of his insanity. For this I used dry brush and Photoshop. Very cool Chris. You seem to be able to pull off anything, any style, any subject, any medium, with your infinite bag of art tricks! Great work again. Extreme talent. Found your site through an awesome artist on Google + and am glad he mentioned you. Thanks for the brushes. I'll pass along your blog info, you deserve the recognition!